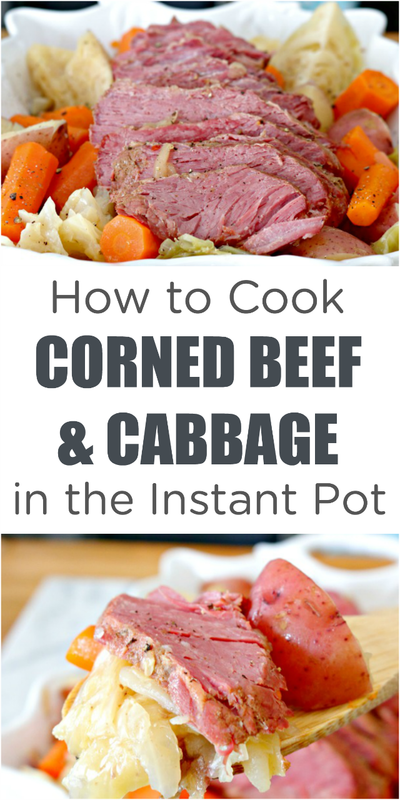 When I first got my Instant Pot, I immediately knew that I wanted to make corned beef and cabbage in it. It’s one of my favorite meals, and for some reason, I’ve never, ever tried making it at home. This past weekend, we went to Louisville for a concert, and had lunch at an Irish pub, Patrick Oshea’s. As soon as I saw corned beef brisket on the menu, I had to have it! It was sooo delicious! So, yesterday, I hit the grocery store and bought the ingredients to make it in my Instant Pot. You guys!!! It turned out so perfect! Like, mouthwatering, I couldn’t stop eating it, PERFECT! 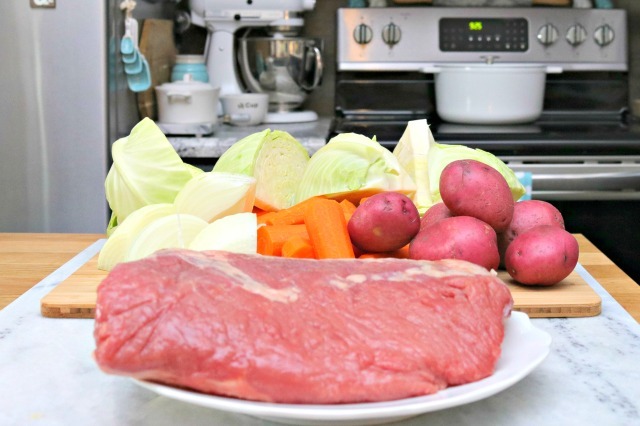 I put together a quick video showing just how easy it is to make my corned beef and cabbage in the Instant Pot…I switched it up and put the cabbage in with the corned beef for this video. I have to say, I prefer the cabbage when made after the corned beef though. Place steamer basket in Instant Pot. Add 4 cups of beef broth to the IP along with the onion and garlic. Mix in spices or spice pack. Place the corned beef brisket on steamer basket. Place the lid on your IP and lock the lid. Set to cook manually for 90 minutes. Once the pressure cooker is finished cooking, let it release naturally for 10 minutes, then manually release the rest of the steam. Remove the lid away from your body, allowing any left over steam to escape. Remove the corned beef brisket and set aside. To cook the vegetables, add them to the steamer basket. Cook on the Soup setting for 10 minutes. Once the vegetables have cooked, slice the corned beef and serve them all together. If you are interested in purchasing an Instant Pot, you can find it HERE. 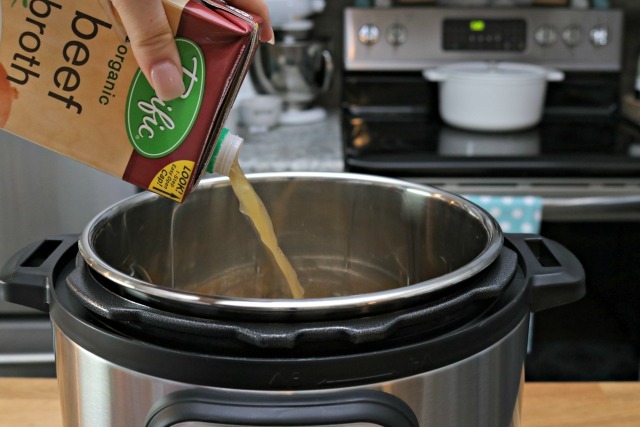 Start by adding 4 cups of beef broth to your pressure cooker. Next, add your onion and garlic. Now, add the steamer basket. If your pressure cooker didn’t come with one, you can skip this part or find one HERE. Time to add your corned beef and spice packet that comes with it! 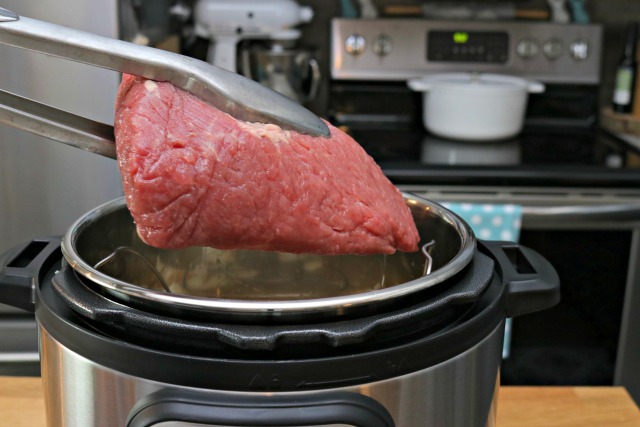 Once your corned beef is in, close and lock the lid of your pressure cooker. Press the Manual button, and set the time for 90 minutes. Be sure your vent is on Seal. 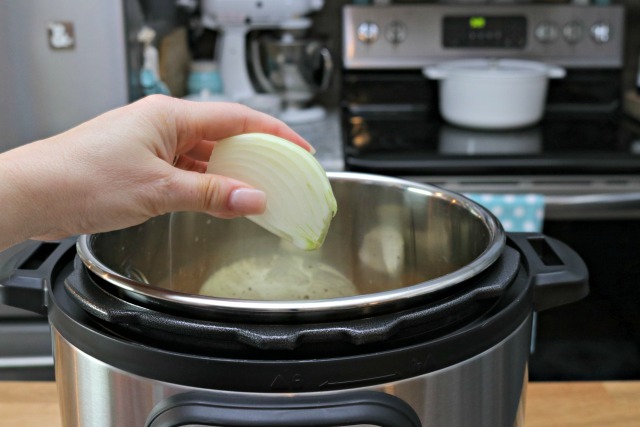 Step back and let your pressure cooker do it’s thing! Now, pull your cooked corned beef brisket out of the instant pot and cover it with foil. Now, time to cook the vegetables! Add in your cabbage, potatoes and carrots. 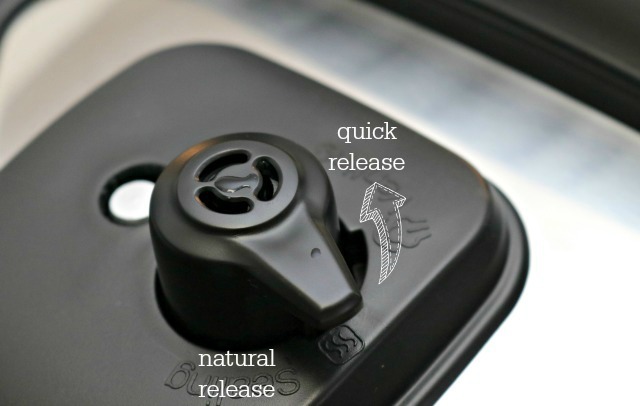 Replace the lid and lock it. Press the soup option and set the cook timer for 10 minutes. Once it finishes cooking, turn the steam release valve to Venting to quick release the steam. Once the steam has released, pull your veggies out and place them in a dish. Slice your corned beef and place it on top. To finish it off, spoon some of the liquid from the pressure cooker over the corned beef and vegetables…it’s full of flavor! 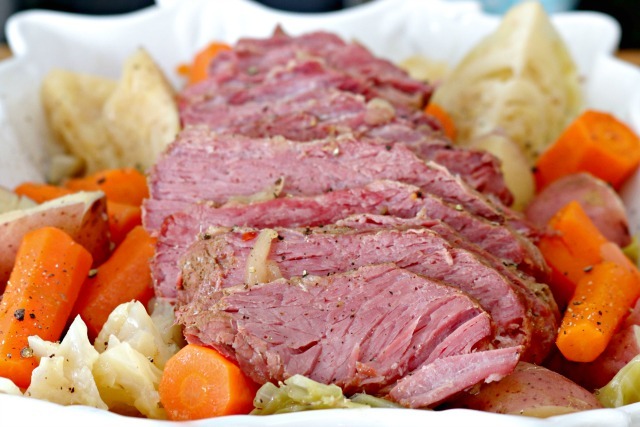 Your corned beef and cabbage is ready to serve and eat! It’s so easy to make this meal, and I can’t wait to serve it up to some friends in a couple of weeks on St. Patrick’s Day! The great thing is that I won’t have to wait until March to enjoy this tasty meal now…I can make it any time I want! 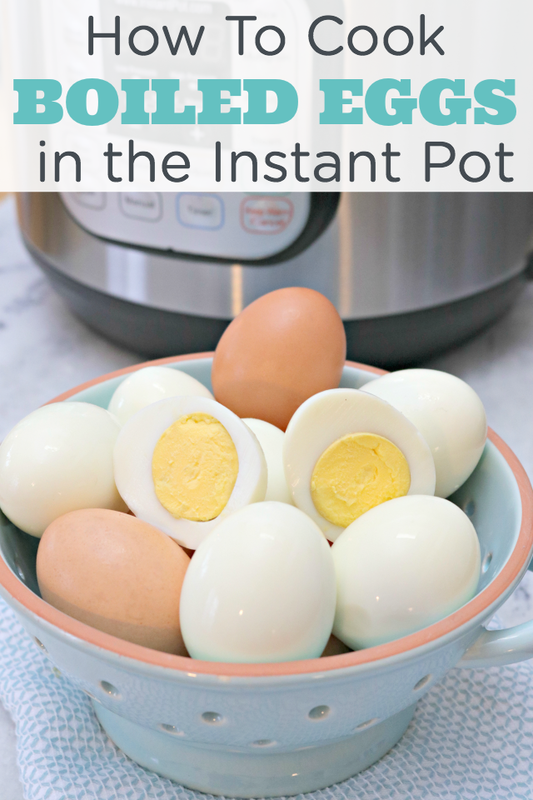 This quick and easy tutorial showing How to Cook Hard Boiled Eggs in the Instant Pot is perfect whether you need just a few hard boiled eggs or a bunch for Easter egg dying! Jessica, I just bought an Instant Pot yesterday and am looking for recipes to cook in it. I looked at the recipe book that came with the pot and wasn’t partcularly interested in anything in there so keep posting your recipes for us. I am delighted that you posted the corn beef and cabbage recipe and the boiled eggs. I look forward to future recipes. I have no idea how to use my new toy but look forward to learning. Does it matter which cut of the corned beef I buy? Hi Jessica, I love corned beef and cabbage. Havnt had it in ages. Well I just have ONE QUESTION. I moved out to college and don’t have a pressure cooker. Will these steps work the same with a slow cooker / crock pot ? You have to cook a lot longer in a crock pot. I had to cook mine for minimum six hours. That’s why I got the instant pot. Hi, get the flat cut, it is normally processed in a bag for St Patty’s day. It does matter.make sure to buy the flat cut. How do I adapt this to a slow cooker or crock pot? Thanks for your help! What do you do with the spices? Hi Jessica, love your ideas! Ordered an Instant Pot on Amazon, made the hard boiled eggs today, they turned out perfect. Keep on sending new recipes. 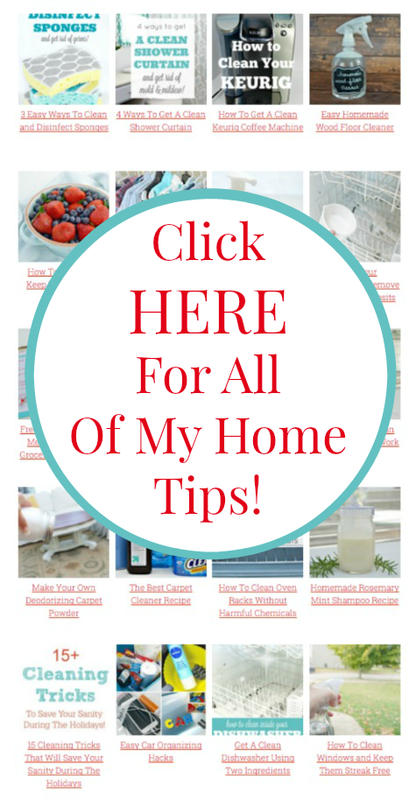 When I have cleaning questions, I turn to your website. Being quite old, I still can learn ! 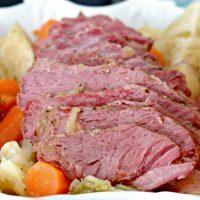 Planning to do corned beef for St. Paddy’s – your recipe looks great, but I have a question. Usually when I have made corned beef before, there is a spice mix that goes into the water/broth. I don’t see any mention of that here, am I missing something? Put the spice packet in with corned beef. Adds flavor. Thanks you made this so easy and great directions! Was delicious!! Howdy! The corned beef recipe sounds great! But 90 mins? That sounds like a long time. Hi, Anthony! It is unusually long for a pressure cooker, but it’s needed because it is such a tough cut of meat. I promise…it comes out perfectly every time! MY pressure cooker will only go as high as 60 min. Is this enough or do I let it release and set it for another 30? which part of beef is corned beef? can anybody explained me, please. It’s the same cut as brisket, except it’s brined. It’s found in meat department. Ask where you can find it. Is there a printer friendly corned beef and cabbage? We made this tonight! I am IN LOVE. I always like to make corned beef & cabbage when traditional, but for some reason I was craving it in December… Costco has the briskets, and I just got an Instant Pot… Well, I’m sold on this recipe forever. It was soooo good and put all the other methods to shame IMO. Yes, including the pressurization time for both the roast and the veggies, it’s a little bit of time from start to finish. BUT, the veggies cooked to absolute perfection in 10 minutes (and I was worried my potatoes were not going to be done, whole gold and reds with a single fork poke in them) but they were divine. The carrots I cut on the diagonal in 1″ or so – pretty thick slices – and they were melt in your mouth. The roast I got was a little large for my 6-quart Instant Pot, but all that means is that the very thick part of the meat sliced, and the thinner part was starting to fall apart, at 1.5 hrs. I could say that if you have a very thick roast and want it to all be fork tender, do a couple minutes longer. But we are SO pleased. Also, there was no spice packet with the beef (weird right?) so I grabbed some “cracked peppercorn seasoning rub” from the pantry and sprinkled it heavily on top. The brisket was already corned, though. I concur with Amy, by far hands down the VERY BEST corned beef recipe I’ve ever made!!! Even my very picky father-in-law said it was the best he’s ever hard and he’s usually a harsh critic with my cooking. I will never do another corned beef and cabbage recipe ever again. Also, I love corned beef and cabbage any time of year! I love this recipe, but can’t print it. It would be nice to be able to print. i live in U.K and hire they not selling briskiet with pocket of seasonning so what to add for flavour? I have the same question as Nancy…. is there a printer-friendly version of your Corned Beef and Cabbage? I have to keep running from room to room as I am trying to follow the directions on the computer. I have 2 corned beefs, total weight 7-8lbs. Can both be cooked at the same time? if so what would the adjustments be on the insta pot form 2 corned beefs? Talk about easy….I didn’t use garlic or onions and just put the meat fat side up on the steamer basket (salted thoroughly) and rubbed the spice packet on it. Filled the pot just below the tray line with water and then liberally added celery seed powder in the water and on the top of the brisket. DEE-LICIUOS! Absolutely the best! Made according to your directions except I only had chicken stock instead of the beef. Diesnt seem to make ant difference. I will be making this again! Love this recipe ! I just wish you had made it possible to print it out in a friendly version!! Followed the recipe, except I used 4-cups of chicken bone broth. I also rinsed and par-boiled the corned beef in PC at manual for 0 minutes, this helps remove the saltiness from the beef. I would give the recipe high marks(5-stars). The corned beef was fork tender and tastes GREAT. I made this tonight for dinner and it was fantastic! I’ll never go back to slow cooking the corned beef again. The recipe was perfect. Thanks for sharing it. 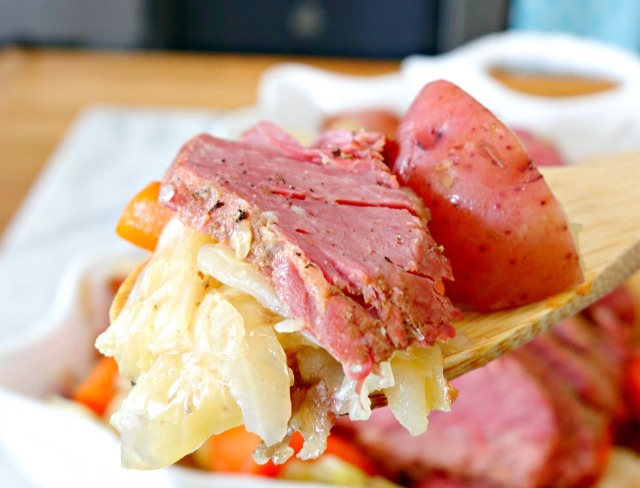 This was the best corned beef and cabbage recipe I’ve ever made! The meat was so tender and the vegetables were the perfect texture! I will only use my IP to cook this meal in the future. Thank you for sharing the recipe! This recipe is so easy and sinfully good! I’ve made it exactly as is and have also substituted 2 cups of broth for 1 can of Guiness on another occasion. Both so delicious! Best corned beef. EVER. 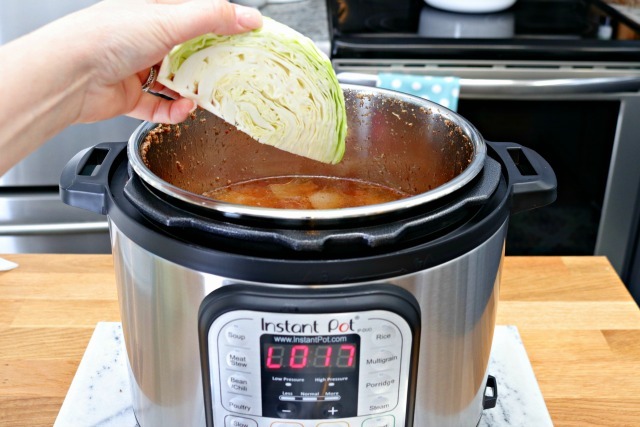 Love the instant pot! Making this for the 2nd time tonight. This is by far the best corned beef ever!! My fellas can’t get enough of it. We make this all the time. We use water opposes to beef broth for the meat bc the brothers it too salty for us. We also put the onion in at the end with the other veggies but just half or quarter it so it doesn’t fall apart. Great meal. The briskets in my grocery store don’t come with a spice pack. What are the spices and their quantity so I can make up my own please. Thank you so much for this recipe. This was the first thing I made in my instant pot , and it came out fantastic. So happy to hear it! It’s one of my favorite things to make now that it’s so easy! As long as they fit well in the Instant Pot, that should be no problem! 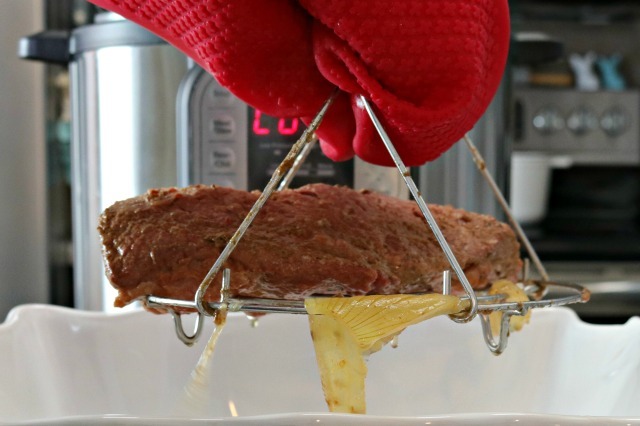 Would 2 four lb corned beefs need to be cooked longer than 90 minutes? I’m not sure they would both fit…I’ve never tried two at the same time. I wish I had a better answer for you. My instant pot doesn’t have a “manual” button. I guess it was replaced with a “pressure cook” button. Would I be cooking the meat on high pressure then? Yes, just cook the meat on high pressure since there is no manual button. Hope this helps! Love how good and easy this is! We love it! Thank you! Made this today. Turned out Phenomenal! So easy and delicious! This was my first time cooking corned beef/cabbage and I’m not exactly known for my cooking skills but I can’t stress enough how easy this was! All in all it took a little over two hours when you account for the time the pot needs to pressurize (once for the meat and again for the veggies) so make sure you take that into account when planning your meal. I will definitely be making this again! Omg… This is the first time I used my Instapot, making the corned beef recipe (did the potatoes and vegetables separately). It was the best corned beef I have ever made. My husband agreed! Can’t wait to try more recipes now. I was intimidated by the appliance for some reason even though I bought it on good recommendations. I wasn’t sure if it was working correctly after having an actual pressure cooker many years ago, expecting the hissing from the pressure release as things cooked. It was such a pleasant surprise to have such an outstanding, delicious corned beef emerge from the pot. I highly recommend this recipe and the Instapot!! Great! I would cook the veggies less than 10 mins next time, just so for texture. Flavor was great! Made this for St. Patrick’s today and it was amazing. The meat was tender and the veggies cooked perfectly. Thank you so much for posting! Thanks for the recipe, I tried it today and it went well. My only deviation was my Power XL does not go to 90 minutes, it has a maximum of 60 minutes which the manual says is good for corned beef. It came out okay but I think the extra time would have made it better. Next time I’ll just add 30 minutes after the 60 minute timer goes off. Love this recipe! So flavorful and the vegetables come out perfect! !